3. Metabo BST15.6 PLUS 02276 1/2"
- You have to wear goggles, (not just safety glasses) earplugs, a dust mask, gloves, and I'd recommend coveralls. This tool throws a lot of dust and small chips. I did not use a vacuum because I felt the hose would slow me down too much, but a vacuum should make the job much cleaner. - Watch out for nails. You have to set the nails before you strip the paint. Just give the nails a wack before stripping. If you do snag a nail, it will either shave off the top or rip it out of the board. It's something you don't want to do too often. The tool is well made except for the little doors covering the rabbet blades; I busted one off the first day. It has a nice long and flexible cord. Pet peeve: the switch turns off too easily. It's not perfect, it's just better than any other tool for stripping paint. And, it'll pay for itself on the first job. I just spent the last two days using this paint stripper and I gotta tell you this is an amazing tool. It will shave (no pun intended) hours off the time it takes to strip paint from a house. I was worried about the price, but it has paid for itself already. I am ripping paint off of cedar siding in 1/4 of the time it usually takes. The depth-of-cut adjustment lets me adapt to different paint millage, and it is really easy to use. If you have read other reviews, you will know that the little plastic doors that protect the 90, 180 and 270 degree cutters are really flimsy and WILL pop off, but it is still the best paint stripping tool I have come across. Make sure that you set any nail heads that may be in your way, because this machine will rip and warp any nail haead it comes in contact with. You will need ear protection, and the 3M full face mask is a must when working in warm climates. Try this tool. It will save you so much time and so much hassel. If you don't like it, send it back. I bought this tool about a year ago, and has you've read in the other reviews it's all true. I took down some 6" redwood siding, 4" fir and pine boards to the bare wood in no time. A word of caution on softer woods wider than 3", take your time and get use to the machine. It will gouge on the edge at times, depending... how your reach is to the work. You either even it up with a pass from the oppisite side, sand with a 6" inch orbital down to finer grit, or patch and sand. I used it on latex paints so far and gumming was not a problem, plus good life from each edge of the cutting bits (4)... if you counter sink any nails. Attching my shopvac made less to clean up! Also rough grain wood texture will be smooth flat when done, you may do some light sand blasting to match the texture or stick with chem/citrus strippers. Goggles recomened. I bought this tool to take about 17 layers of paint off the cedar siding of my house. It works great! My choices were the Metabo, Porter Cable and The Paint Shaver (which was by far the most expensive). The Metabo was the only tool of the three not listed on eBay the day I purchased it. This tool does a great job on siding and even facia and window casings. You need to be careful on softer wood like pine with this tool. It can easily take off the paint as well as a hefty slice of wood. Be sure to purchase plenty of extra blades if you are taking off lots of old hardened paint. They will get dull, however you can turn the blades 180 degrees and use the other side before you have to replace them. This tool is extremely loud. Be sure you have good ear protection. Also, it throws chips everywhere at high velocity. So good goggles and a dust mask or respirator will save you some agony. Overall, for the money this is a great tool. I highly recommend it over manual scraping or liquid/paste strippers. I purchased the Metabo paint reomover about 2 months ago. I used it to remove about 6 layers of paint from the fascia boards on my house. This tool works amazingly well and is very easy to use. When all of the paint was removed, i gave the fascia boards a quick once over with a random orbit sander. When finished, the fascia boards looked brand new. One coat of primer and two top coats of paint and presto, my home looks great. Doing a thorough job in the first place prevents you from having to return and "fix" it in a couple of years. Initially I was very skeptical of how this tool would work as well as the seemingly steep cost. I wondered how a hand held power tool the size of an angle grinder could cost sooo much. In the end, I feel this tool easily saved me money because a paint contractor would probably charge me a small fortune to take all of my homes fascia boards down to bare wood before repainting. My home was built after paint containing lead was banned so I opted not to use the dust collection built into this tool. One gripe is that I broke one of the small tabs on one of the plastic blade covers within 2-3 hours of use. The plastic covers should be made more durable considering the cost of this tool. If you are removing paint on a significant amount of wood or on a home with very much wood siding, I would suggest you purchase the extra 10 piece blade set ). I own the barrel-grip version of this jigsaw and really like it; although, I had to buy it from Tools Plus since Amazon doesn't carry it. I especially like the 12' long cord. I use the barrel-grip version of this jigsaw for a variety of remodeling tasks, but it's invaluable as a coping tool, particularly when working with hardwood crown moulding. To use the jigsaw for coping, I highly recommend replacing the factory foot with the Collins Coping Foot (from Collins Tool Company), which allows you to make all sorts of extreme cuts. The saw is held upside down so that it's easy to see the blade and accuratly follow the coping line, and this is where the barrel-grip version of the jigsaw comes in handy because it's so easy to grip upside down. There's no handle to get in the way. I'd give the barrel grip version 5 stars without reservation. The other day I was dismayed to see the exact same saw as the top handle Metabo jigsaw for sale at Home Depot. The only difference was that it was marketed under the Ridgid brand and cost about $30 less than the Metabo. I looked at the Ridgid very carefully and it was identical to the Metabo in all ways except color. I suspect there must be a shared product licensing deal between Ridgid and Metabo. The good side of Ridgid selling the same saw is that accessories like the anti-splinter insert should be widely available wherever there's a Home Depot. The 4 star rating is because Metabo charges $30 more than Ridgid for the exact same jigsaw. I ended up buying the barrel handle version from Tools Plus because Amazon didn't carry it (I did ask Amazon if they could get it). As others have said, it's very smooth, the blade changing mechanism is better than Bosch's, and it feels sturdier than the Bosch which I was able to pick up at Home Depot. While I was cutting a rail for a sliding tub door, the blade jammed into the aluminum, but the body of the jigsaw absorbed most of the shock. If you use the vacuum extension, dust doesn't fly all over the room. It lands in a neat pile directly under where you cut. The blower also keeps the blade clear so you can see what it's cutting. The included cord is nice and long. The case is humungous; no idea why they made it so big. The biggest plus the Bosch has is you can get parts for it anywhere. The Metabo takes Bosch blades, but it takes some digging to find the anti-splintering inserts, etc. 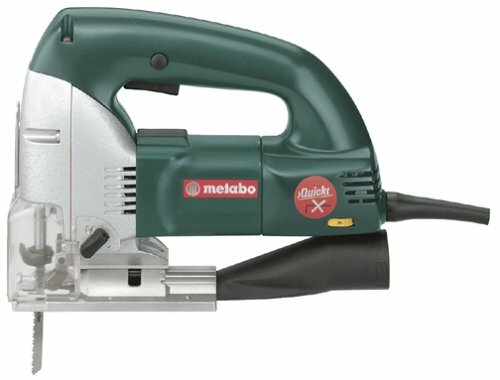 Metabo has a bunch of other accessories that no one seems to carry in the US (ask the MetaboUSA.com folks for the catalog page), like a really expensive edge guide, no mar feet, etc. This is without question a great jigsaw, better than the old Bosch reliable. However, if you're in the market for very high end jigsaws, you'll have to also consider the Fein (also from Germany) and which you'll probably need to special order. The one downfall of Metabo, which you need to be aware of, is that if it breaks, it's a pain in the [rear] to get it fixed. (In America, at any rate.) Good Luck! As a building contractor, I use and abuse cordless drills everyday. I own 3 Dewalt drills and the 15.6 Metabo. The metabo beats dewalt in every way. I have never had any trouble with the drill or the charger. The case is a little flimsey but still works and seems to hold up. The reversed direction switch takes a little getting used to. This drill has more power than the 18V dewalt and is handier to use. The drill is well balanced and seems to fit into tight spaces better than others. This drill is a must have in my toolbox. The BST 15.6 Plus has an actual torque of around 212 inch lbs, or the 24 Nm (Newton meters) as listed at the Metabo web site in Germany. This is not adequate power for my needs, but should be powerful enough for most. The impluse function works OK. The batteries fit very well. The case is strong. The plastic bit holder is a joke that bites my hand. The variable speed switch is rough in activation, but works OK in performance. Weight is 950 gms for bat., 1334 for drill for 2284 gms (2.28kg) total or 5.03lbs, NOT the 4.2 lbs (1,9kg) advertised. I have had this drill for over a year, and have been very pleased with it. The impulse feature works well for starting screws, and the reverse direction switch is in a good spot for left handed users. Plenty of power - never any trouble with the keyless chuck - the two batteries have held up well. Only drawbacks are - no Metabo cordless trim saw to share the battery/charger, and taking some grief from my buddies for buying a German drill. I would not advise anyone to buy this drill. First, its base is too heavy, making this tool awkward to handle. Secondly, the chuck is difficult, doesn't hold the screw tips firmly, and they ALWAYS slip out. Also screw tips & drill bits get stuck in the chuck at a crooked angle when trying to tighten them. Third, sometimes the impulse mechanism doesn't work at all, and other times the drill is stuck in impulse mode. Fourth, The batteries burn out after 6 months of moderate use. Fifth, the case they give you is cheap plastic with latches that don't close, causing the contents to spill out when it is set down upright. Sixth, replacement batteries are impossible to find (if you even desire to), whereas DeWalt batteries are everywhere. I could go on and on. (...) I would personally recommend the Dewalt 14.4. Its the first grinder I ever had and I think its awsome hard to slow down easy and change disks. I am a commercial mechanical contractor using tools in the harshest environments. 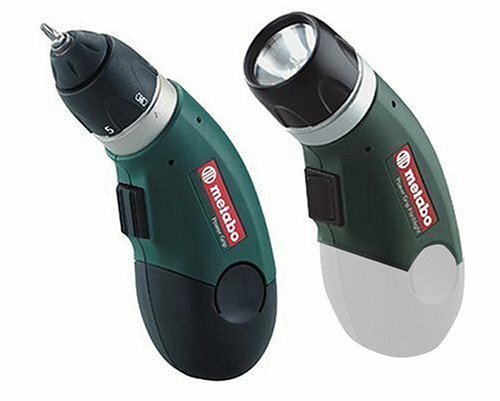 Having used almost all brands, I have found Metabo to be the only one that holds-up. Forget Bosch, Makita, Porter-cable, Dewalt, Milwaukee, and Hitachi. I have tried them all and none will last under heavy use. Metabo's motor technology and general tool ruggedness is superior to all I have tried. Fein might make a comparable product, but at a much higher price. I have only owned/worked with two Metabo angle grinders in the last 8 years. It's all I have needed. I own one that is 7 years old, and has only ever needed a switch slide, power cord, and brushes. I have worked it extrememly hard, at jobs which destroyed Milwaukee and DeWalt grinders in a day or two: cutting apart 330(35/15)Stainless steel fixtures and racks for repair using an .040 cutting disk. I worked the thing so hard I needed to keep my welding gloves on to hold the gear box. (NOT something I would recommend for any other angle grinder.) It has suffered numerous falls from welding tables, tool carts, and even ladders, and kept right on running. The only reason I am buying another is aesthetics: the old one is ugly, covered in pockmarks and the logo is worn off. This screwdriver has three serious flaws. First, it is a bulky handful. You need to have an immense hand to hold it easily. Second, the switch is ill placed and awkward to use. Third, and most important, it has only one speed and that is top speed. So you spend much of your time trying to reset the blade (Phillips or not) in the head of the screw after the blade pops out. And it pops out because the Metabo only operates at full speed. The best way to use it is to preset the screw with a regular screwdriver and then use the Metabo. I'd return mine for a refund if I could find the receipt. So don't buy it. Look instead at the Dewalt. Same price, better features. I was going to go with a Panasonic because of their excellent battery life, but the design of their cordless screwdriver just wasn't to my liking. After reading these reviews and paying the most attention to the battery life I purchased this little gem. The first project was using it to put-on and snug down bolts on the construction of a 24' X 30' metal garage building (60+ lbs of bolts). From morning til after dark I used this screwdriver, and it did great. It needed recharging after all that but to have lasted the day with what I was doing was really impressive. I'm still on the second battery - 1st charge, I've put together 11 PC's with it and it's running like it's at full charge. On the bad side I do agree with the reviewer who said the rocker switch should be front to back, totally agree, it's awkward at times. Other than that the torque adjustment, the recharger, the batteries, the case, the holster, the material it's made out of, ... I'm thrilled with all of them ! Great screwdriver ! I have had this power screwdriver a few weeks now, and it is really a great little tool. It does everything that I have asked it to and more. I have used it several times (a couple of times for an extended period), and I have just now had to switch batteries. It has exceptional power for such a small tool. I really recommend this tool for the get up on the roof type jobs as well as a second unit in the shop. Work safely! Reply to "am I missing something"
I just recieved my order for the 10 piece set of carbide blades for the metabo paint remover. Yes, there were actually 10 blades in this set as stated. Ignore "am I missing something". His or her response is solely based on the picture showing only 3 blades. People shouldn't write reviews who don't know the facts! I bought a Metabo to strip 8 layers of paint from all of the moulding and window frames in my 1912 home. After using the tool for the first time I got rid of both of my heatguns. I didn't need them anymore, the Metabo could take care of everything. The price tag is really steep, but it has paid for itself in saved labor time. I have 3 orbitals in my pro shop. This one is by far the best. Make sure you get the cloth bag if you can't connect to your dust collector. Very impressive power and performance. The dust bag even works well - unlike my Makita and Bosch. Vibration is minimal also. A GREAT sander. I do believe the new Rigid 6" is made by Metabo, so you may be able to save a few bucks. I've never used the Metabo, but you might want to consider the Ridgid R2610 6 Inch Sander. It's made by Metabo and has all the same features as the SXE450. In fact, the Ridgid comes with a dust collection adapter that will allow a 2 1/4" hose connection. Also, the price is right at $119.00. I give this product 3 stars due to its price compared to the Ridgid. I purchased this sander after extensive research. I felt that the Fein 6", while excellent in all performance characteristics, was not worth the cost unless you are in a production situation. I looked at the 6" Porter Cable w/dust collection in a side-by-side comparison. The Metabo was significantly smoother, had a larger dust collection port, and really moved air into that port even without a vacuum hooked up. Now, after using it on six interior oak doors, I am thoroughly impressed. Though a little more expensive than the immediate competition, I know this is one of those tools where I will "complain about the price once", and enjoy using it for a long time after. Only "dings" are Metabo needs to include a case and some essential dust collection accessories. A SANDER THAT NEVER STOPS IMPRESSING ME! I HAVE BEEN USING THIS SANDER FOR THREE MONTHS NOW, AND I CAN WITH A DOUBT SAY IT IS ONE THE BEST ORBITAL SANDERS I'VE USED THUS FAR. NOT ONLY CAN IT CUT QUICK - BUT WITH A SIMPLE PUSH OF A BUTTON YOU CAN ADJUST THE ORBIT TO 1/8th INSTEAD OF 1/4 ROTATION. THIS 1/8 SETING WILL GIVE IT A S W I R L F R E E FINISH THAT A LOT OF OTHER ORBITAL SANDERS CAN'T EVEN DREAM OF! SO NOW YOU HAVE THE BEST OF BOTH WORLDS ALL PACKED INTO WELL DESIGNED SANDER. PRAISE TO THE GERMANS FOR THIS OUTSTANDING WOODWORKING MACHINE. NO, I'M NOT GERMAN! ITALIAN.